Enhancing the look of your kitchen does not have to involve a major renovation. At our showroom, we proudly offer a number of options for kitchen backsplashes a. Our collection of materials includes stunning styles that add flair to rooms of any size. Shop with us today to update your space with our tile backsplashes. You'll find endless options in marble and stone backsplashes when you meet with our design experts. As a homeowner, you have enough to do each day without worrying about keeping your space clean. For this reason, it is essential that you choose a material that stands the test of time. If you are looking for a classic option for your kitchen, we are happy to offer a full selection of tile backsplashes to fit any décor scheme. Tile is a beautiful and durable material ideal for a wide range of surfaces. When placed as a backsplash, it protects the underlying drywall from harmful grease and food splatter. This makes it easier than ever to clean up messes made in the kitchen while cooking. In addition to its practical performance, a backsplash from our collections is able to create an appealing design that effectively brings together aesthetic elements like cabinetry, flooring, décor, and paint. Do you love the appeal of rustic finishes? 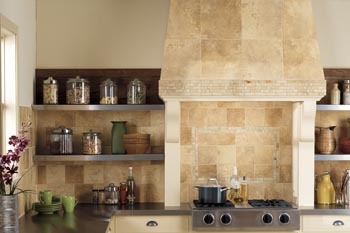 Bring this rustic style home when you install stone backsplashes in your kitchen. Stone is the perfect addition to any type of kitchen design. Often featuring rough, uncut edges, a natural stone backsplash gives homeowners a way to take the overall look of their kitchen to the next level. If you want a noticeable enhancement for a minimal investment, you can’t go wrong by choosing one of the exclusive stone styles from our selection. The look and feel of luxurious marble makes it one of the most coveted materials for floors, countertops, backsplashes, and a range of other surfaces. No matter what part of the room you add this beautiful material to, you are sure to create a luxury atmosphere for your space. Marble backsplashes are an increasingly popular option for homeowners looking for a classic ambiance. Exquisite marble comes in a number of beautiful, and often neutral, hues that perfectly complement today’s modern design aesthetic. When you’re ready to find stunning the stunning marble design of your dreams, we invite you to visit us to peruse the impressive inventory available at our location. Once you've chosen the perfect design for your room, ensure that your job is finished the right way when you request a backsplash installation from our team. Hiring an experienced installer is just as important as choosing a quality backsplash. To guarantee your backsplash continues to impress far into the future, entrust the placement process to us. We handle every backsplash installation with the utmost professionalism, allowing you to start enjoying the new surface sooner than you ever thought possible. Our team covers every detail for a flawless result to your installation. With all of the time you spend in your kitchen, shouldn't it be a room that you are proud to show off to your friends and family members? Many homeowners dream of adding a new look to their space, but their budget simply does not allow for a major renovation. Fortunately, there is an easy way to enhance your space without going through construction. Kitchen backsplashes are practical surfaces that can also serve as eye-catching feature of your room's design. If you want to make the most of your backsplash, make replacement the next project on your list of home improvements. At our store and showroom, we believe that kitchen backsplashes are the perfect way to deliver an instant and affordable update in a dull kitchen. Our team is proud to provide selections and services that make it easy to achieve the backsplash of your dreams. From trendy to traditional, you can depend on us to deliver a backsplash sure to satisfy your unique tastes. Do you have an idea in mind for your backsplash? Whether you already have the perfect design in mind or you need a little inspiration to get started, we are happy to help you through the process. Our talented team of designers works closely with our customers to create an eye-catching product. No matter what kind of backsplash style you have in mind, we are equipped to deliver a custom creation using the many materials found at our store. Our associates take the time to understand your expectations in budget and look. We use this information to create custom styles for kitchen backsplashes of any size. We are thus able to point you towards the lines and collections most likely to impress. Whether you are in search of simple subway tiles, are more interested in a colorful mosaic, or are even dreaming of something in marble, we have you covered. Contact our floor store designers to create custom looks for your kitchen backsplashes. We proudly feature endless styles in tile backsplashes for customers throughout Denham Springs, Brusly, Port Allen, New Roads, and Baton Rouge, Louisiana.